Want to get rid of bulky tripods and experience the best portable mount available for GoPro cameras? Do you get irritated by the weight of your ordinary tripod whenever you are on a travel or an adventure? Do you want to buy a portable, compact and lightweight mount so that you won’t have to bear the extra weight of ordinary tripods anymore? Well, we have got all the solutions to your questions as we are going to review the best portable and compact + lightweight mount available in the market for GoPro cameras. Pedro UltraClamp is for people who often get irritated by the ordinary tripods because they require much more space and are also much bulky. Most of the people like to carry a portable and compact shaped mount for their GoPro cameras so that to avoid extra weight and more space accommodation issues. 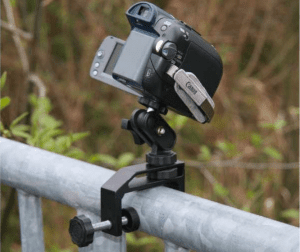 To overcome this issue, Pedco has released the best mini portable mount for its customers which has got the attention of many action vloggers and GoPro users. The mount is selling like a hot cake these days and is loved by people due to its compactness, durability, ultra-reliability and high performance. Well, how can we ignore the importance of such a great tripod? Of course, we have to review it for you people so that you can know more about it. So, today, we are going to discuss every bit of the Pedco UltraClamp mount and will give our honest review about it. Pedco UltraClamp is the best mount available for GoPro cameras in a very reasonable price range. It has got such features and specs which makes it the best mount for GoPro cameras out there at the market. Furthermore, the features like durability, reliability, compactness, and portability make it more attractive for many GoPro camera users. The Ultra Clamp’s concept is based on mounting your camera to the places where the tripod is unable to or is very difficult to adjust. You can attach this mount to buses, railway tracks, grills, posts, benches etc. The UltraClamp is able to clamp on these type of terrains easily. Like most of the Pedco mounts, the UltraClamp also uses a double jointed ball combined with a socket head so that it can work properly. The UltraClamp is very easy to adjust and use as the operation is quite simple. You just need to tight the screws and adjust the mount according to your needs and BINGO, your mount is successfully attached to any terrain you want. The mount can easily be used in both directions i.e. horizontally and vertically because it’s very easy to adjust on different surfaces like posts, benches, double Decker buses, and fences. Well, as most of the people will know about the sizing of UltraClamp but for those who don’t have any idea about it, UltraClamp comes in with three sizing i.e. 1.5″, 2.5″ and 4″ respectively. Now you must be thinking that which size is optimum and can be used on surfaces of different thicknesses. The answer is simple. The 2.5″ one is the best choice as it has got a versatility in fitting to thin and thick surfaces easily. We will personally recommend you to buy the mount having a 2.5″ size. However, if your main problem is to attach the mount to thick surfaces then the 4″ one is the perfect and ideal choice for you. Well, there are many reasons one should love the best mount for GoPro cameras. 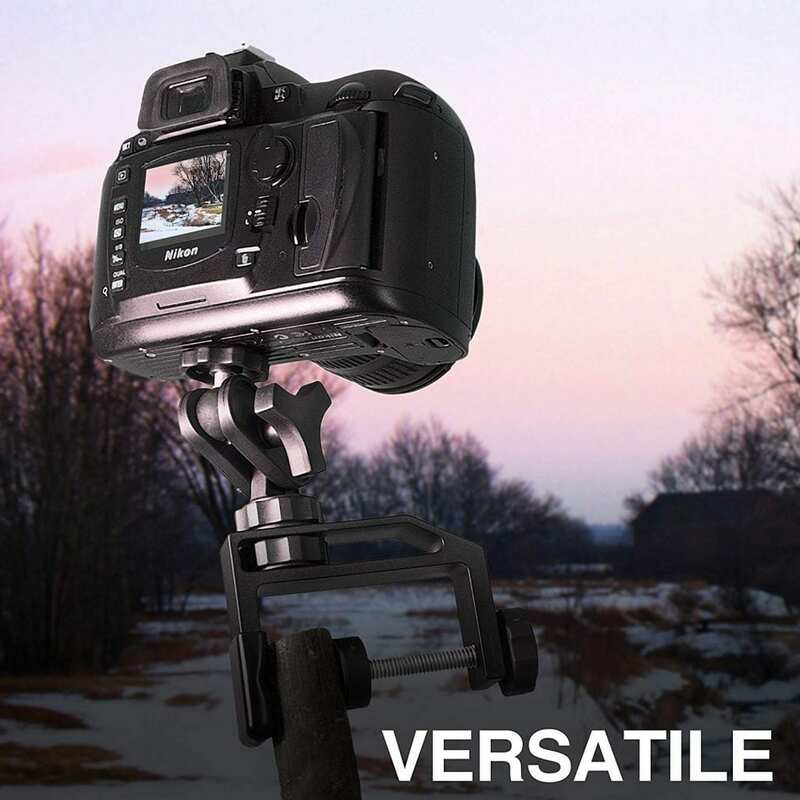 It’s really awesome and will work as a tripod for you as well. Let’s take a look at some of the reasons about why we love the Pedco UltraClamp. Tripod has got its own virtues and features but if you look at the other side of the story, the Pedco UltraClamp is more than enough to kill a tripod. Yeah, you heard it right. I mean who will need to carry a bulky and a heavy tripod for long tours where you have to hike for days and weeks daily? No one right? On the other hand, the tripods also require much more space and that’s also a reason for people to get rid of it. Now, these kinds of problems are solved by the Pedco UltraClamp as it has got a very compact design which means it doesn’t require a very high space. The mount is lightweight as well. You won’t even feel the weight of this mount while you are on a hike or an adventure. So, in this way, the Pedco UltraClamp mount is slowly taking the place of a tripod and is the first priority for action camera vloggers as well. You can easily attach the Pedco UltraClamp on the frame of a double Decker bus. Many people use it on the buses frames to get high-quality shots of the outer view. While a tripod faces difficulty in attaching to a park bench, you can easily attach the Pedco UltraClamp mount on the bench of the park. It is perfect for people who want to shoot the videos of kids playing in the park from different perspectives. The Pedco UltraClamp mount is so compact that it can easily get attached to a restaurant table. Now, who won’t like taking pictures or making videos from a table point of view with the help of their GoPro cams? Everyone will like it and this function can easily be done with the help of UltraClamp mount. You can easily mount this UltraClamp on the antique doors to get a whole new perspective to shoot your videos or photos. Pedco mount is also used to mount on patio railings of different houses. Now if you want to capture the movement of beautiful clouds while you are in a rest house or a place which is in the mountains, you can easily attach your Pedco UltraClamp mount to railings of these houses to capture beautiful cloud movements. Another way to get perfect and wide angle shots with your GoPro camera is to attach it to unwanted places. This work can be done by the Pedco UltraClamp easily as its ability to be attached to signposts and tree branches easily giving you a whole new perspective to shoot different video clips easily. Well, after discussing some reasons to love it. Now we will get on with the technical details. We will discuss some of the best specs it provides along with some key features, pros, cons and our final thoughts. So, sit tight and give it a thorough read to decide about buying the best mount available for GoPro cameras. The camera is able to ft any device such as camera, camcorders, binoculars and GoPro cameras. 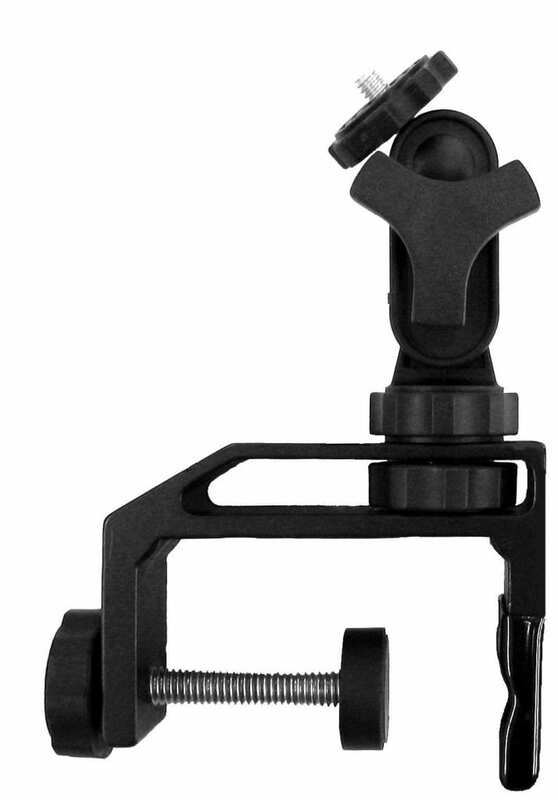 It comes in with a 1/4″ tripod socket which lets it easily adjustable to most of the devices as well. The Pedco UltraClamp is easily attachable to round and flat objects which have got a thickness from 1″ to 2.5″. Well if you want to attach the UltraClamp with more thick surfaces, you should better go for a 4″ sized mount. The mount is able to hold a weight of about 6 pounds. This is more than enough to accommodate bulky cameras and camcorders as well as GoPro cameras. The high weight bearing ability makes it the best mount available for GoPro cameras. The Pedco UltraClamp mount has got a good panning adjustment. It has got a 360° panning option which allows you to pan the camera in almost every direction. The mount has got a good tilting adjustment as well. It allows you to tilt the camera in both upward and downward directions. The upward and downward angles are 90° respectively. Pedco UltraClamp has got dimensions of 4 x 1-5/8 x 6-1/8 inches which makes it quite compact and easy to take anywhere. You can take this mount even in the pocket of your jacket easily. The camera mount has got a weight capacity of 6.0 ounces which is very less considering the features it provide. The high quality materials used in the Pedco UltraClamp mount makes it a lightweight mount for action vloggers and GoPro users. The mount is extremely portable. You can literally take it anywhere you want. The portability effect let it take an edge our tripods and monopods as they are not much compact. You can easily take this mount in your jacket’s pocket whenever you are on a hike or an adventurous trip. 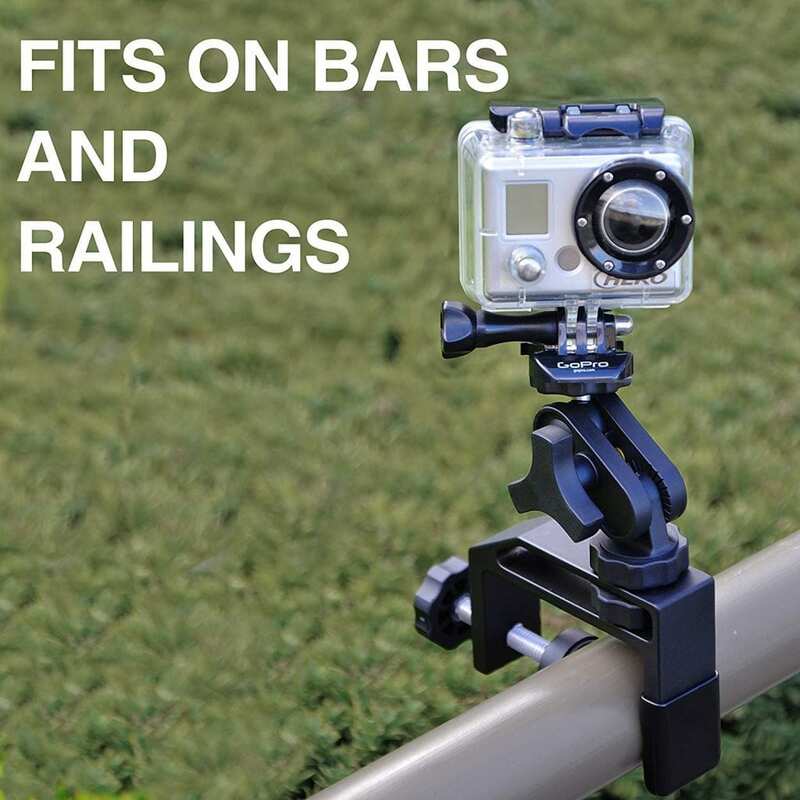 Pedco doesn’t rely on the construction materials of its products and that’s a good way to gain the attention of the GoPro users because they are looking mostly for a durable and long-lasting mount. All the materials used in its construction are made up from aluminum which adds extra durability and reliability to the mount. Most of the people think that this mount isn’t able to bear much weight as its very small. Well, they are all wrong. The aluminum clamp body and high quality screws allows the Pedco UltraClamp to hold weight of about 6 pounds. 6 pounds weight is more than enough as your main purpose would be using only GoPro cameras and they are mostly lightweight. But if you want to use bulky camcorders, you can mount them with this accessory without any fear. The attaching ability of the mount is quite exceptional. It’s one of the main reason that people like it very much. You can attach the mount everywhere you like to get shots from completely different perspectives. Car windows, patio railings, tree branches, park benches, bus frames, are some of the places where this mount can be attached easily. Even when tripod has got many features and spec, the Pedco UltraClamp is way better than it when it comes to portability, acquiring space, attaching ability and durability. Tripods require more space and they cannot be attached to unnecessary places like park benches or bus’s frames. Whereas the Pedco UltraClamp mount is able to do all these functions with very less weight, compact size and most of all, great attaching ability. Last but not least, the clamp has got a very affordable price range. Instead of buying the hefty priced tripods, you can buy this mount in only under 40 dollars. yeah for only under 40 dollars, you can enjoy the best mounting accessory better than most of the ordinary tripods in almost all features. So, it’s really a peace of mind that Pedco UltraClamp has got a very reasonable price even with that much specs and features. Holds weight of up to 6 pounds. Thumb Screw Knob is not of high quality. Well, that was a long review of one of the best clamp available for GoPro cameras. The Pedco UltraClamp has got many advanced features and yet comes at a very affordable price range. After a long review, we are now sure that you can easily decide between buying a high priced tripod or to buy this amazing little beast with many features and an affordable price. So, make up your choice and buy Pedco UltraClamp for added stability and for taking wide angle shots from different perspectives easily.